Bruce McCandless flying through space, free. An astronaut floats alone with the blackness of space behind him and the bright blue limb of the Earth below. He's untethered with nothing but a NASA-made jetpack to protect him. NASA astronaut Bruce McCandless — who died at the age of 80 on Thursday — is that untethered astronaut in one of the most iconic space photos of all time. "My wife [Bernice] was at mission control, and there was quite a bit of apprehension," McCandless said in 2015 of the 1984 spacewalk that led to the photo. A wide shot of McCandless. "I wanted to say something similar to Neil [Armstrong] when he landed on the moon, so I said, 'It may have been a small step for Neil, but it’s a heck of a big leap for me.' That loosened the tension a bit." He was also the first person on Earth to speak to Armstrong from the surface of the moon, according to space historian Robert Pearlman. "His call, 'Neil, this is Houston. We're copying,' were the first ever words spoken to a human standing on the moon," Pearlman wrote on collectSPACE.com. But perhaps McCandless's most significant spaceflight moment — the one that defines his career — is his untethered spacewalk and the photos from it. That stark image of McCandless flying free in space is evocative of so many of the things that capture the imagination about spaceflight. 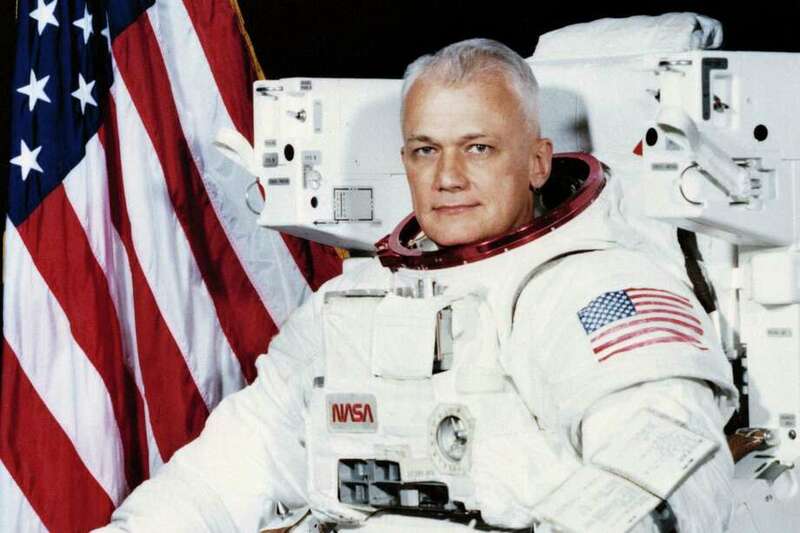 Former astronaut and retired U.S. Navy captain Bruce McCandless II died Thursday in California at age 80. He was the first to fly untethered in space, where he logged more than 312 hours. Bruce McCandless II, the first astronaut to float untethered in space, died Thursday, NASA officials said. He was 80. McCandless, originally from Boston, was one of 19 astronauts selected in April 1966. He flew on two Space Shuttle missions, in 1984 and 1990. During his 1984 mission, McCandless became the first astronaut to fly untethered from the spacecraft using the Manned Maneuvering Unit (MMU). 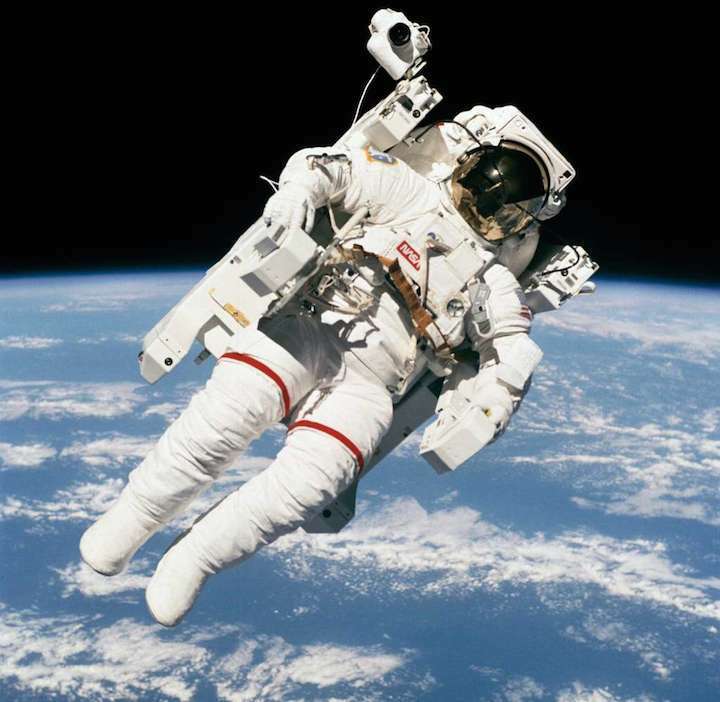 The photograph taken of that spacewalk is now considered one of NASA's iconic photos. "My wife was at mission control, and there was quite a bit of apprehension," McCandless wrote in 2015. "I wanted to say something similar to Neil (Armstrong) when he landed on the moon, so I said, 'It may have been a small step for Neil, but it's a heck of a big leap for me.' That loosened the tension a bit." His 1990 mission entailed the deployment of the Hubble Space Telescope, which still orbits the Earth and mainly observes visible light. McCandless, a retired U.S. Navy captain, logged more than 312 hours in space, but he also contributed to NASA missions when he wasn't in space. He was the mission-control communicator for the Apollo 11 mission moonwalk, completed by Neil Armstrong and Buzz Aldrin. He also was the backup pilot for the first Skylab mission. He was inducted into the Astronaut Hall of Fame in 2005. Johnson Space Center officials confirmed he was in California when died. "Our thoughts and prayers go out to Bruce's family," said Robert Lightfoot, NASA's acting administrator. "He will always be known for his iconic photo flying the MMU." McCandless is survived by his wife, Ellen Shields McCandless, of Conifer, Colo.; his son, Bruce McCandless III, of Austin and his son's wife, Patricia; his daughter, Tracy of Islamorada, Fla.; and two granddaughters, Emma Rose and Carson Clare of Austin. He also is survived by his brother, Douglas, of Washington, D.C.; and sisters Sue Woodridge and Rosemary McCandless, both from Texas.